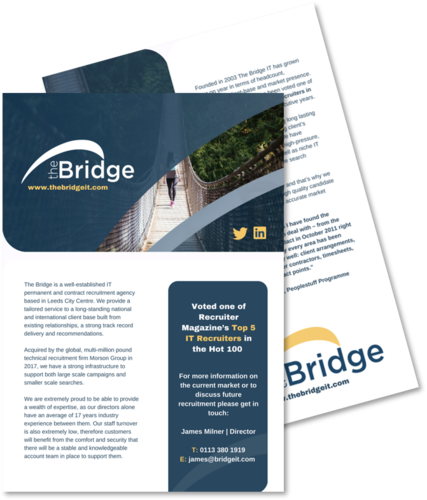 Founded in 2003, the Bridge has grown year on year in terms of headcount, profitability, client-base and market presence. We have become the go-to agency for IT, Digital, Analytics and Transformation professionals looking to progress their career. Based in Leeds City Centre, we provide a tailored service to a long-standing national and international client base built from existing relationships and a strong track record of delivery. Acquired by the global Engineering Recruitment firm Morson Group in 2017, we have the feel of a boutique business but with the infrastructure and support of a global company at our backs. This has given us a platform to invest heavily in new technology, services, staffing, marketing initiatives and really drive our business forward. 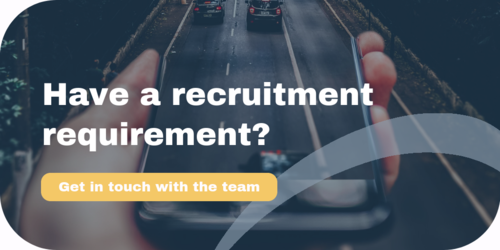 We are in an unrivalled position to provide a wealth of IT recruitment expertise with the directors alone having an average of 17 years' industry experience between them. There's a real mix of personalities, backgrounds and interests across our team and that's what sets us apart. Our people are central to our success and our tight-knit culture is evident in the way we take care of our employee's on both a personal and professional level. From junior level to senior management - we're all on the same page and are treated as equals. We pull together to provide the best possible service to our candidates and clients. We love what we do and we have fun while we do it – one of the main reasons we have a very low staff turnover in an industry that suffers from typically high attrition rates. Our focus is on building long lasting relationships by understanding client’s needs, culture and values. 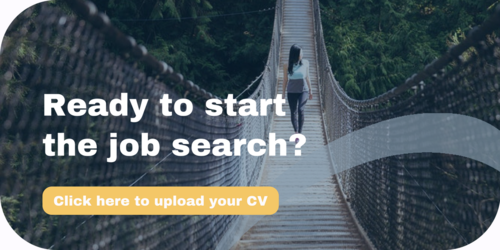 We have experience of delivering on high-pressure, high-volume accounts as well as on niche IT requirements and executive search assignments. Attention to detail is key and that’s why we always provide high quality candidate shortlists and accurate market feedback.